Yongnuo are a Chinese camera accessory manufacturer who are now creating lenses and Gary Wolstenholme has put their 50mm f/1.8 Canon fit lens to the test in his latest review. Yongnuo are a Chinese camera accessory manufacturer, better known for their flash units, which are compatible with most of the major SLR camera systems. With this 50mm f/1.8 lens for Canon EOS cameras, it seems they’ve branched out into making clones of camera lenses too. 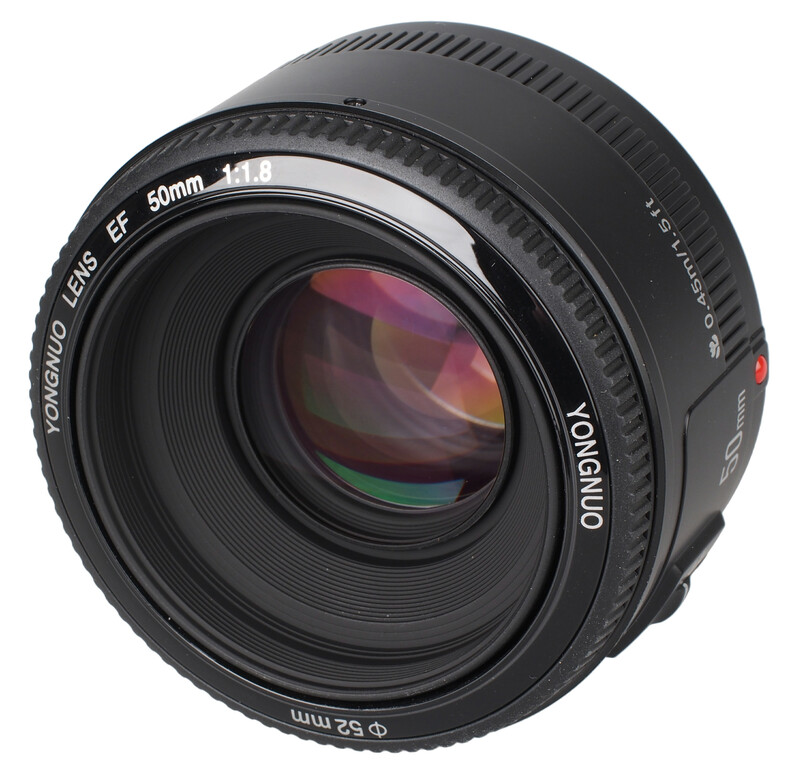 This Yongnuo 50mm can be picked up for between £40 and £50, which is cheaper than Canon’s own 50mm f/1.8. In this review, we’ll take a look at how it performs. Weighing only 120g, this lens is very lightweight, being 10g lighter than the lens it owes its design to. Just like with the Canon version, the lens barrel is constructed almost entirely from lightweight black plastic, as is the bayonet. It all feels a bit brittle and probably won't cope with much abuse. 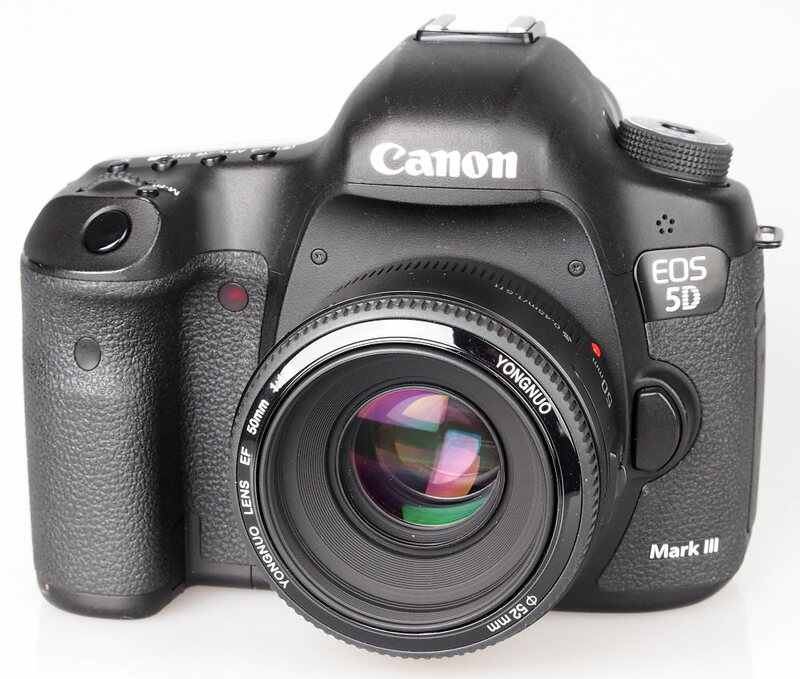 The light weight and compact size makes for a nice combination with the Canon EOS 5D MkIII body used for testing. Autofocus is reasonably quick, although it is not especially accurate with the sample tested. 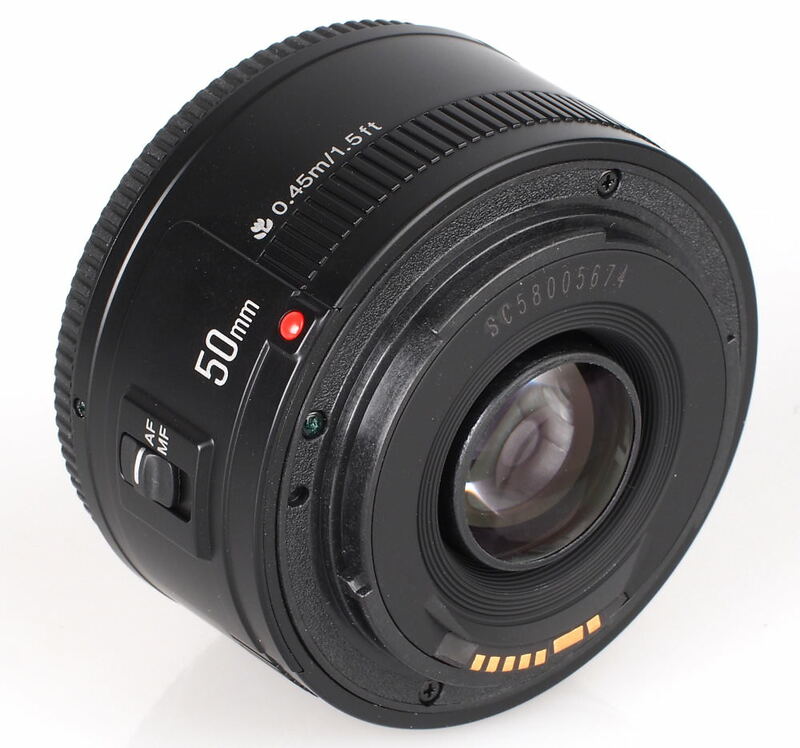 As is the case with the Canon 50mm f/1.8, the autofocus motor is engaged with the ring, which rotates as the lens focuses. There is no way to disengage the manual focus ring during autofocus, so care needs to be taken to keep fingers clear of the ring as it rotates back and forth. In manual focus mode, there is no damping applied to the focus ring, which can make applying fine adjustment tricky. Focusing isn't performed internally, but the 52mm filter thread does not rotate, making this lens ideal for use with polarising and graduated filters. Just like with the Canon lens, the filter thread is 52mm in diameter, so those wishing to use their standard 58mm or 77mm filters on this lens may do well to invest in a step-down ring. The minimum focus distance of 45cm is typical for lenses of this focal length and aperture. Overall, this lens is so close in design and handling to the Canon EF 50mm f/1.8 II that there is nothing between the two lenses in this respect. At maximum aperture, sharpness in the centre of the frame is already very good, although clarity towards the edges of the frame is fairly poor. 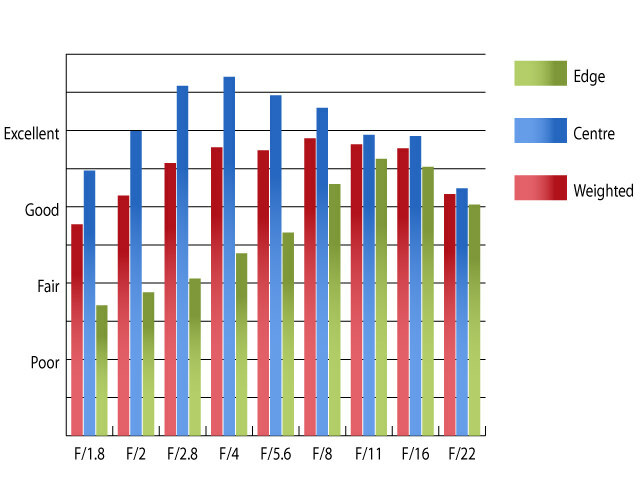 Stopping down improves performance across the frame, although the difference is more dramatic in the centre than towards the edges. 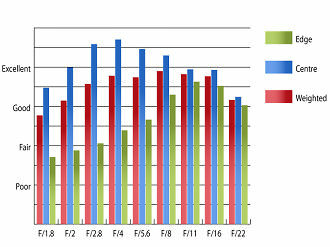 Peak performance in the centre is achieved at f/4, where clarity is outstanding. Sharpness towards the edges takes a long while to catch up, only reaching good levels by f/8 and peaking with very good sharpness between f/11 and f/16. For this review, the lens was tested on a Canon EOS Mk III using Imatest. Chromatic aberrations are well controlled, with fringing hovering around the 0.5 pixel widths towards the edges of the frame between maximum aperture and f/4. This level is low enough to cause few issues, even in very large print sizes, or with harsh crops from the edges of the frame. 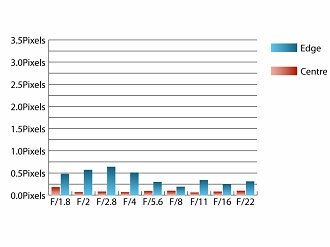 For this review, the lens was tested on a Canon EOS 5D MkIII using Imatest. Falloff of illumination towards the corners is quite pronounced. At f/1.8 the corners of the image area are 2.54 stops darker than the image centre and stopping down to f/5.6 results in visually uniform illumination. Barrel distortion is typical for a prime lens with a fast maximum aperture. Imatest detected 1.4% barrel distortion, which may become noticeable in images with straight lines parallel to the edges of the frame, but should pose few issues most of the time. The distortion pattern is uniform across the frame, so it should be relatively straightforward to correct in image editing software afterwards. No hood is supplied with this lens. Even so, the front element is recessed and is reasonably well shaded as a result, so a hood may not be needed. Shooting into strong light sources, such as the sun, may result in a noticeable loss of contrast under certain circumstances. Strong light sources outside the frame may also cause flare. 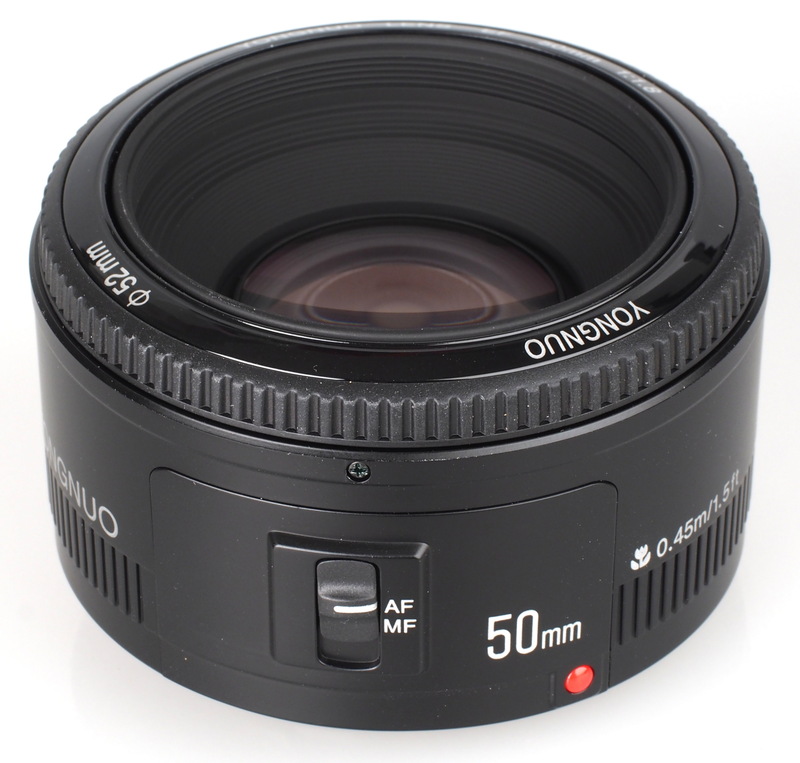 This Yongnuo YN 50mm f/1.8 costs between £40 and £50, depending whether you get it shipped straight from China or not. The Canon 50mm f/1.8 II lens it is a homage to costs around £75, which makes the Yongnuo lens about 53% of the price of its Canon equivalent. Canon’s own EF 50mm f/1.8 II has long been championed for offering decent optical performance with no-frills and good value, due to its low price. Yongnuo’s clone looks as though it may offer even better value for money for those on a budget, as it performs very similarly to the Canon optic and handles exactly the same. 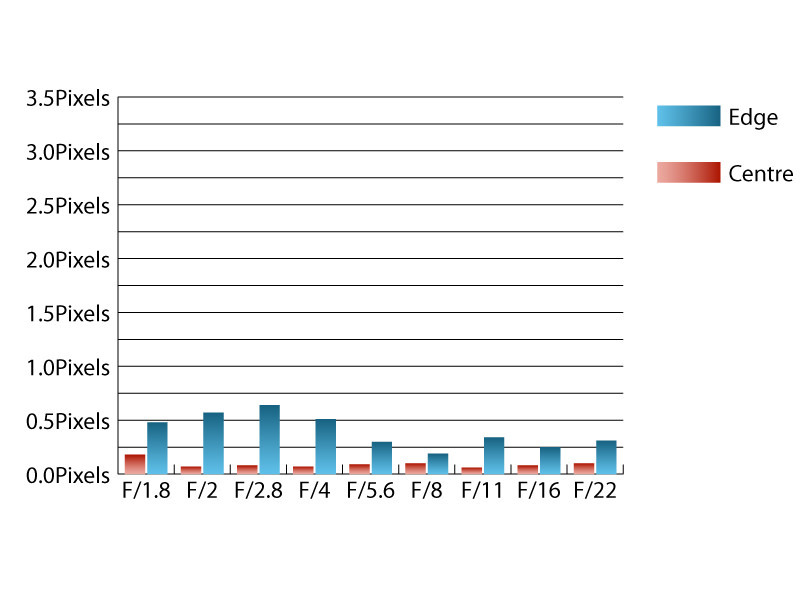 Autofocus accuracy was a bit off on the sample tested, but this doesn’t mean it will be for every copy. For a measly £40, it’s probably worth the risk. I’d imagine you may have to rush if you want one though, as it is such a close copy to the Canon lens, there may be a legal team twitching somewhere at Canon HQ. I cannot fault their flashguns, never had problems with them, but a rip off lens? Why blatantly copy the canon nifty? This copy is legal because the lens design is so old that the patent has already expired.. It does beg belief really, i mean, if Yongnuo have the means to produce good glass, why not make it their own? Not saying that the optics on this are as sharp as a Canons, but for the average snapper, i am sure they would not notice, and surely this is who the lens is aimed at? Consumers who know bugger all about photography? I think they missed a big trick by just cloning the nifty fifty, yeah the 50 is an amazing lens from Canon, but it looks so dated now, and not even pretty, maybe a slight redesign would make it more desireable to consumers, who knows, we got flashguns, now lenses, whatever next, a Yongnuo 5ds mkIII? Not that i dislike Yongnuo, far from it, their flashguns are very good, no complaints there, but it just provides light, add an element to an image, whereas a lens could make or break an image, and this just wont cut the mustard! It does beg belief really, i mean, if Yongnuo have the means to produce good glass, why not make it their own? Not saying that the optics on this are as sharp as a Canons, but for the average snapper, i am sure they would not notice, and surely this is who the lens is aimed at? Consumers who know bugger all about photography? I think they missed a big trick by just cloning the nifty fifty, yeah the 50 is an amazing lens from Canon, but it looks so dated now, and not even pretty, maybe a slight redesign would make it more desireable to consumers, who knows, we got flashguns, now lenses, whatever next, a Yongnuo 5ds mkIII? Not that i dislike Yongnuo, far from it, their flashguns are very good, no complaints there, but it just provides light, add an element to an image, whereas a lens could make or break an image, and this just wont cut the mustard! [quote] China wants everything & I'm so scared for world's future[/quote] I doubt they intend to behave as badly towards us as we did to them when we were the dominant power. I doubt they intend to behave as badly towards us as we did to them when we were the dominant power. Very useful as I have just spotted one on eBay.